Dave Chick visited this system, under construction, in December 2007. 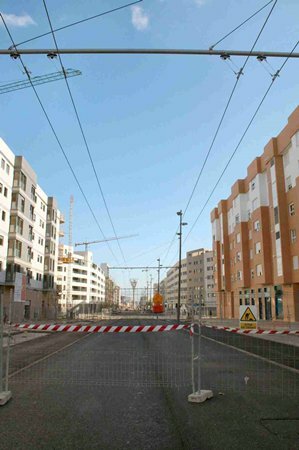 The January 2008 issue of the BTS magazine “Trolleybus” included a report on a visit to Spain ’s new trolleybus infrastructure on 16 December 2007. This is a very brief extract from that article, which included further photographs. Most of the overhead is now in place, although it appeared unlikely that the road infrastructure would be completed in time for the claimed January 2008 opening. The university end of the line is completely closed to the public, with overhead suspended above private right of way. There is then a long straight section along Passeo de la Universidad, with the trolleybus line using a central reservation. At the end of this section the trolleybus overhead comes to an end and is tied off. There is then a construction site where it appears that there will be a bridge for the exclusive use of the trolleybuses. This is where it seems that most of the outstanding work remains to be completed. On the other side of the construction site is Passeo Morella, where the trolleys will have reserved way running next to the road for general traffic. Traction poles with bracket arms have been erected here, but there is at present no further overhead. This road runs past the bus station and adjacent main rail station and then crosses a main road, on the other side of which traction poles have been erected, but without bracket arms at present. Beyond this the terminal arrangements are not obvious but it seems that the city centre terminus will be unwired. Once the line opens, if it is a success it could well influence further developments within the region. The photo shows Passeo de la Universidad, looking towards the city centre. The trolleybuses will run on a central reservation here.